Sunshine Mills, Inc. is issuing a voluntary recall of select products of Evolve® Puppy, Sportsman’s Pride® Large Breed Puppy and Triumph® Chicken and Rice Dog Food. Photo Credit: FDA with illustration by WINK News. There has been a voluntary recall of dog foods on Tuesday as they elevate levels of vitamin D, which can lead to serious health issues. 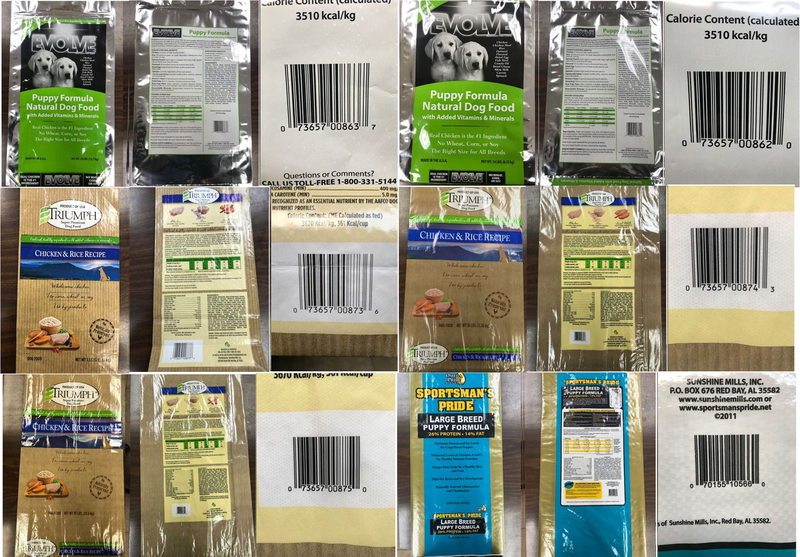 Sunshine Mills, Inc. has issued a recall of select products, which include Evolve® Puppy, Sportsman’s Pride® Large Breed Puppy and Triumph® Chicken and Rice Dog Food. Bags affected have a “Best Buy Date Code” — located on the back of each bag — of Nov. 1, 2018 through Nov. 8, 2019. These products have been distributed in retail stores within the U.S. and several other countries, per the U.S. Food & Drug Administration. Dogs that consume these products may exhibit symptoms of vomiting, loss of appetite, increased thirst and urination, excessive drooling, along with weight loss, according to the FDA. The government agency advises pet owners to contact a veterinarian should their pet exhibit those symptoms. Also, to throw out any of these products or return them to the retailer it was purchased for a full refund. Visit the FDA website for more information on the recall.